Our research engages with community, industry and government. The InstaBooth research project employs design approaches to engage local communities in a debate on the future of their urban environment. We need new ways of thinking, innovative problem solving and greater agility to combat a rapidly changing world. Drawing on in-depth research and expertise from a wide range of disciplines, we offer effective and innovative approaches to help organisations and communities to develop new ideas and initiatives, collaborate, solve problems and open up new opportunities. Our consultancy and commercial research services are tailored to suit our client's needs and the context in which they operate. evaluation of sources and trends in public sector funding for the arts. The APAM inter-year report for the Brisbane Powerhouse provided an evaluation of international market development outcomes, as well as evaluated national market development outcomes through showcasing work to national presenters and producers. 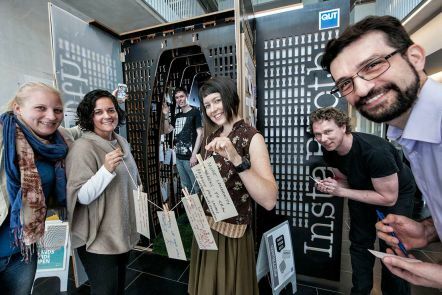 The InstaBooth is an interactive booth containing different kinds of interactive opportunities, including interactive screens, projectors and cameras, a black board for writing ideas with chalk, pin-boards for post it notes and drawing surfaces. The InstaBooth allows locals and passers-by to have their say on a wide range of current issues and topics or on new plans and strategies being developed.